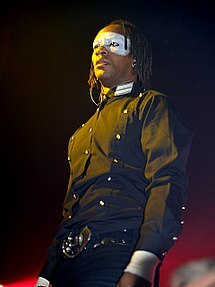 Keith Palmer (born 21 March 1967), better known by his stage name Maxim (previously Maxim Reality), is an English musician, known for being a vocalist of electronic music band The Prodigy. Palmer was born in Peterborough to Barbadian parents, the youngest of seven children, and he attended Jack Hunt School, also in Peterborough. He enjoyed writing poetry and verse and began MC-ing around the age of 14. He gained inspiration from his ten-year older MC brother, Hitman, who introduced him into the Peterborough Reggae Soundsystem Scene. At the age of seventeen he had his first gig in Basingstoke. Ian Sherman, a fellow musician from Nottingham teamed up with Maxim and they formed Maxim and Sheik Yan Groove, where Sherman made the music and Maxim contributed with lyrics. After recording some tracks together and not getting any attention from the record industries, Maxim decided to disband and went on a three-month travel throughout Europe and North Africa. Upon returning to England he moved to London to get more into the music and reggae scene of the metropol. Through a friend, Ziggy, he was offered a gig with a band called The Prodigy, which he accepted. He was planning to do just a few gigs with the band, but he later decided to stay. Maxim lived near Keith Flint, a fan of Liam Howlett. After convincing Howlett to start a band, Flint recommended Maxim as a manager on the strength of Maxim's experience in the reggae scene and the music contacts he developed. Maxim did not show up at a scheduled meeting but joined them unexpectedly at their next gig, improvising lyrics. After MCing, Maxim contributed lyrics to studio albums after Experience from 1992 (although his vocal contributions were heard in the live track "Death of the Prodigy Dancers" on Experience). Maxim provided lyrics in the single "Poison" from Music For the Jilted Generation (1994), "Breathe", and the canned single release "Mindfields" both from The Fat of the Land (1997). 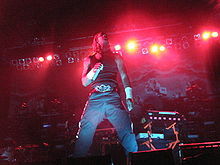 However, Maxim was absent from the Prodigy album Always Outnumbered, Never Outgunned from 2004; Howlett said he believed the band needed to reinvent itself, without vocals from Flint or Maxim. Despite rumors to the contrary, the band did not break up, though Maxim explored a solo career. 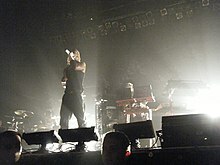 On Invaders Must Die, Maxim returned as a vocalist, as the band reverted to its prior way of working. Due to the almost constant touring and recording with The Prodigy, Maxim rarely had a chance to create solo material. After the band started to take it easier after the intense touring to support The Fat of the Land in late 1997, he finally had the spare time to work and finish some of his projects. That year he released "Dog Day" on the XL promo Against the Grain, which also featured Howlett's "Dirtchamber Remix" of "Diesel Power" (from The Fat of the Land) and Maxim's cover version of the Rolling Stones' "Factory Girl". On 9 August 1999 Maxim released the EP My Web, which contained five tracks. In 2000 Maxim had a collaboration with Skin from Skunk Anansie on the song "Carmen Queasy", which remains his biggest solo success. It peaked at No. 33 on the UK Singles Chart in June 2000. A second single, "Scheming", was released 11 September and reached UK #53, and the album Hell's Kitchen, was released on 2 October 2000. Maxim's second solo album, Fallen Angel, was released in 2005 and spawned one single, "I Don't Care," which failed to chart. The album was released in multiple formats, including a limited edition CD. ^ Doran, John (27 August 2008). "The Prodigy Talk To The Quietus About Experience And Jilted Generation". The Quietus. Retrieved 12 November 2018. ^ Batey, Angus (5 February 2009). "'We're animals. We have to stay hungry'". The Guardian. Retrieved 12 November 2018. ^ Himmer, Alastair (24 February 2009). "Just A Minute With: British band The Prodigy". Reuters. Retrieved 12 November 2018. ^ a b Roberts, David (2006). British Hit Singles & Albums (19th ed.). London: Guinness World Records Limited. p. 356. ISBN 1-904994-10-5. Wikimedia Commons has media related to Maxim Reality. "No Good (Start the Dance)"
"Take Me to the Hospital"
"The Day Is My Enemy"
This page was last edited on 20 March 2019, at 22:34 (UTC).